We owe Sergio Leon a great many things, and one of those things is giving birth to the American Spaghetti Western. There are several great Clint Eastwood movies we wouldn't have without the Spaghetti Western nor would Quentin Tarantino have a career (or, at least, fairly different career). There was a certain style Sergio Leon brought to American cinema, and I never thought it could ever be duplicated. It is also so funny how the American gangster parallels the American cowboy so much, even though I feel both had radically different motivations. But it makes perfect sense that a guy who came from a Western mentality could tackle the gangster movie, and tackle it well. 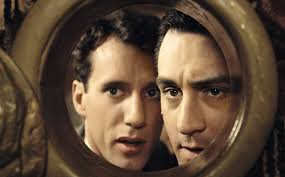 "Once Upon A Time In America" is not like most gangster films, nor most crime films in general. First of all, "Once Upon A Time In America" is an epic crime film. I don't mean that on a level of awesome, even though it is. I don't mean that because the actors give it their all, even though they really do. This movie clocks in at 229 minutes, yes you read that right. The blu-ray I got for Christmas last year not only includes the 229 minute cut, but a director's cut which is even longer. Some people cringe at the thought of a long movie, but I never do. If you give it a try, you will understand the power the movie possesses and its length is just a mere number. A long movie doesn't necessarily mean a boring movie, and "Once Upon A Time In America" proves that with each passing minute. I had to watch this one a couple times before writing about it, because it took me a couple watches to fully absorb the film as a whole. Let alone really follow what Sergio Leon was trying to do. The film is shot in unchronological order. The audience never really knows if "Noodles" (Robert De Niro) is having several flashbacks out of order, or if he's having one vivid opium trip. What's funny is Leon never really did either. I love that we have a gangster film in which fans can discuss at great length, trying to figure out what certain scenes meant. I love that this is a cerebral experience just as it is an epic crime drama and balancing those big ideas is part of the fun of "Once Upon A Time In America." So yes, Robert De Niro plays a gangster, just like he has for most of his career. He's a guy who rises to the top of New York underground, just to fall from grace and leave the city. Only to come back as an old man looking for redemption. This may seem like a typical De Niro movie. But part Robert De Niro undeniable talent comes from the way his characters never feel the same, film by film. "Noodles" never feels like his rendition of Al Capone from "The Untouchables," or Jimmy Conway from "Goodfellas," or young Vito Corleone from "The Godfather Part II." Robert De Niro puts a different signature on all of his characters and "Noodles" is no different. His talent is equally matched by James Woods. Woods plays Max, who grows up with "Noodles" and who rises in the gang life with him. Together, Woods and De Niro create some of the very best efforts of their careers. I also love the work by a very young Jennifer Connolly. If you give "Once Upon A Time In America" a chance, you just might be surprised by how much it effects you.